Except around Easter, chicken eggs usually come in a predictable range of colors: white, brown, and sometimes pale blue or green. Chickens are descended from the Red Jungle Fowl of Southeast Asia, which has been providing eggs for humans for thousands of years. The final color of an egg comes from a pigment the hen’s body adds to the shell just before the egg is laid. Breeds that lay white eggs don’t add any pigment. Today's show brought to you by the Bobolink Foundation. Except around Easter, chicken eggs usually come in a predictable range of colors. White, brown, and sometimes pale blue or green. And the color of a chicken egg depends mainly on the breed of chicken that laid it. Chickens can be found in an amazing range of colors and appearances. But they’re all the same species, descended from the Red Jungle Fowl of Southeast Asia, which was domesticated and has been providing eggs for humans for thousands of years. There’s a loose correlation between the color of an egg and where the specific domesticated breed of chicken originated: Asian breeds tend to lay brown eggs, Mediterranean breeds white, and South American breeds blue or even green. Some find that a chicken’s earlobe color—yes, chickens have earlobes—can sometimes be a rough guide to the color of their eggs: red earlobes with brown eggs, white earlobes with white. The final color of an egg comes from a pigment the hen’s body adds to the shell just before the egg is laid. 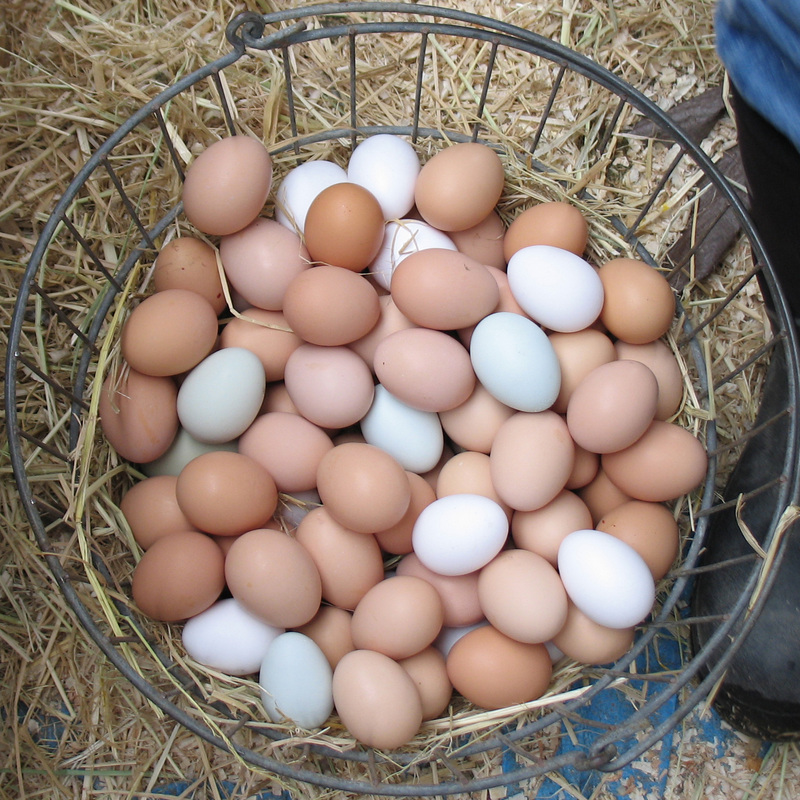 Breeds that lay white eggs don’t add any pigment. In the end, an egg’s color doesn’t tell us much about its nutritional qualities. The big differences in eggs have to do with a chicken’s diet and how it was raised. Bird sounds provided by The Macaulay Library of Natural Sounds at the Cornell Lab of Ornithology, Ithaca, New York. Recorded by Greg McLachlan.